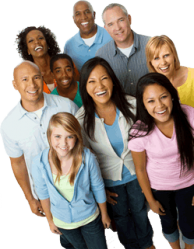 Whether you’re new to the area and need a financial institution you can trust, or you’re looking for a way to keep your money local and work with a member-owned financial cooperative, People's is a great choice. You’ll find a wide variety of accounts for all your financial needs—whether you’re a savvy saver, a young family looking for a better auto loan rate, or opening your very first checking account. Your membership at People's Community Federal Credit Union begins with your Carefree Savings account. Pay your $5 membership fee, and deposit $50 into your savings account, and you're a member! And if you open any other deposit account, then all you need is to maintain $5 in you Carefree Savings account. 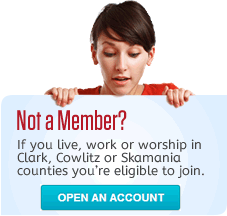 If you live, work or worship in Clark, Cowlitz or Skamania counties, you are eligible to join the credit union and gain all benefits of membership. Family members are eligible too! No matter where they live. *You will be charged a minimal transaction fee for using a non-People's ATM. We're here to serve our members, not make profits for shareholders. Members, not shareholders, elect the volunteer board of directors. You're treated like a valued member instead of just another customer. If you don't find the answers to your questions here, you can always call Our Members Service Line at 1-800-252-6525. To search the website, enter a term below and click the Go button. Get the latest credit union news delivered right to your inbox.